We've all seen the weather reports, summer is pretty much over and we all know it. It was nice whilst it lasted (barely 2 seconds) and the UK prepares itself for more rain and cool winds. But, call me crazy because I am super excited for autumnal fashion! With autumn and transitioning from summer to fall in mind, I bring you today's outfit. Every day I leave the house at around 6:30 am and it is always a little chilly which means I've had to take out my light coats and begin to wear them again (wearing a coat in August seems ridiculous doesn't it?!). It may seem premature as summer technically is supposed to last until late August but I'm already dreaming of all the chunky knits and layers...I told you I'm crazy! I may or may not have also added a few pairs of boots to my collection (thanks to the sales) and I can't wait to show you those in upcoming posts! 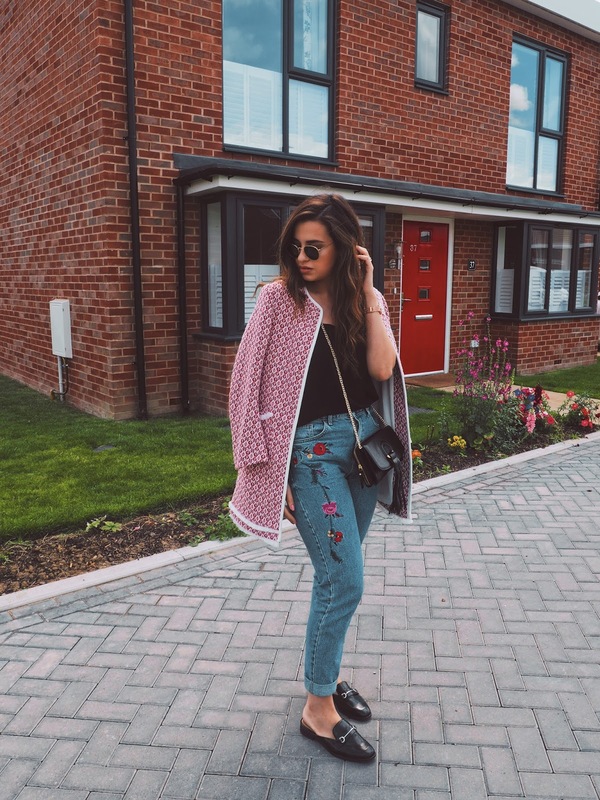 This Zara coat is one my go-to when I need that extra layer in the morning during the week but here's how to style it for the weekend too! Last year, Zara's ecru and blue frayed coat was everywhere. It literally became viral after such a short period and could be seen on everyone, from shoppers to street commuters and even on TV! It came back earlier this year given its popularity in a slightly different design and available in a red and white version too. It was the perfect transition piece from winter to spring, and I'm thinking it will work just as well as we move from summer to autumn. Priced originally at £69.99, I couldn't believe my luck when I spotted it for only £19.99 in the Zara summer sale 2 weeks ago. At the time, only the red version was available in my size but now the blue is too and I am definitely tempted! The coat is versatile, now even more affordable and oh so comfortable making it the perfect item for any woman's wardrobe. It is stylish but at the same time quite a safe choice, even in the red shade. It has that Chanel-esq appeal to it, it feels luxurious and a lot more expensive than it is. The print is distinctive but not too bold and despite being red, it really just goes with everything. I love mixing prints like I did it in this outfit, and it just goes to show its versatility. And, even though there are no buttons, with a nice thick jumper under it I will probably be wearing this during winter too! I know everyone has one of these, but you will agree that this is just one of those trends you can't say no to. Check it out on sale here (update: it may be sold out as I write this) and if you haven't seen it yet, the coat even has its own Instagram page here...yup, it's THAT popular. Call them mules, slip-ons or backless loafers, this a trend right from the 90s that made its way back to the fashion scene of today! They've been popular since the spring, but the weather back then didn't really allow for backless anything but now that the hottest part of summer is done with, I thought I'd bring mine out. These shoes are a smart and stylish alternative to a summer sandal or ballet pump. It has a masculine feel to it and I particularly like wearing them with ankle jeans and an oversized top half. 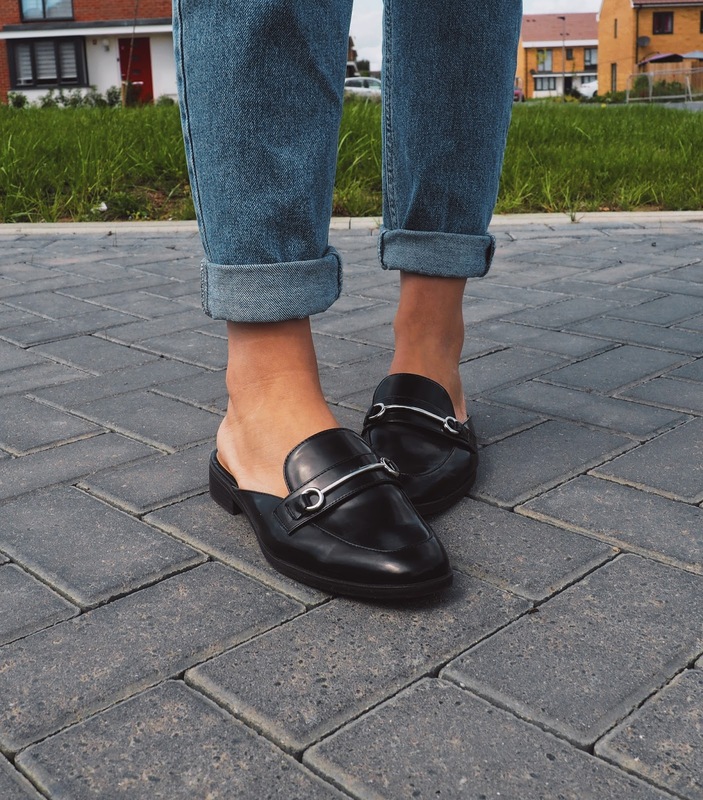 Whilst the shoes make the outfit sharper, the jeans give the overall look a more casual vibe. You can't go wrong with black leather and the buckle detail makes it that much more interesting. I've shared before that I really dislike the look of the furry Gucci version and I seriously cannot get on board with how they look on, but these are much more wearable and I'm excited to see what outfit combinations I come up with for these shoes. I know that with shoes like these, people are either going to really love or really hate them. I confess at first I wasn't sold but I'm pleasantly surprised at how easy they are to style. I got these at M&S for £29.50 (see here) and there's a silver version too. 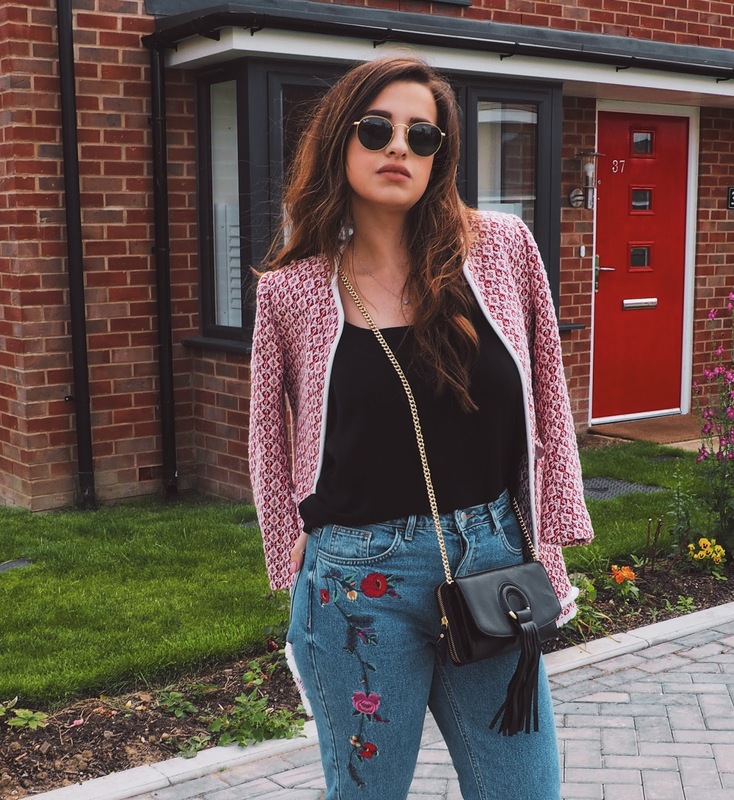 I talked about embroidery not long ago, in fact, in my last outfit if you haven't seen it yet. I wore these jeans last year and my love for it is going strong. It has the perfect mom fit, a nice floral embroidery down the side of the right leg and it looks good with pretty much any choice of footwear, a winner all year round if you ask me. What about you, do you have this coat in your closet too? Thoughts on the other trends? Let me know your opinions below! Thanks so much for reading beauties, you have all made my comeback so special! I'm going to have to check this coat out. Glad to have you back on the blogging scene Pam! I'm far too excited for Autumn already, I've been spending my commute each day scrolling through Autumn pictures on Pinterest! Lindo look arrasou nas imagens, obrigado pela visita. Super cool coat, jeans and shoes! Awesome combination, you look so stylish! We still have some warmth and I refuse to think about autumnal fashion before my summer holiday is over, which will not be until the beginning of September. I did try a similar coat, but it was too long for me. Damn my midget size! I can`t believe Summer lasted only 2 weeks here. I was so bumped by this, I booked some tickets home just so I can see some sunshine. I honestly so wish I could pull off a coat like this! This outfit is chic yet elegant. So gorgeous! OMG it is over already?!?! I love that coat and have a similar one from another store! I love how you paired this look, especially with those embroidered jeans! I must be really out of it when it comes to fashion, because I've never seen that kind of coat before! I'm soooo ready for autumnal temperatures right now, it dropped to 21 degrees yesterday and it was just so nice to wear leggings instead of shorts. You don't seem like you've left - or maybe it's because you came back a little before I did, haha! Effortlessly Beautiful with your ZARA wardrobes. Pam, you look extremely gorgeous in this outfit! It's just perfect combination! I love your jeans and I need an embroidery jeans right now! The lipstick shade is also very pretty! Which lipstick have you applied? Holy cow, you weren't kidding about this coat going viral! An own IG page? Now that's a whole new level to me. The Zara coat is cute. I like your bag too! I noticed that coat in Zara not too long ago, I really like how you've styled it! I agree that this coat is versatile and really amazing, very beautiful, and you look fabulous - the jeans are amazing, the shoes too! I know what you mean, having summer till the end of August, but wearing a coat - I am seldom without a jacket! I really loved this one! Hope you have a lovely day! And I understand why.. Love it! That's one really beautiful jacket. I love your photos here, they look edgy, yet effortless. Wow you look so beautiful ! I love your coat ! Oh man that coat. I didn't realise it gained its own Insta. Love it! I can see why this coat has been popular and it looks amazing on you. I too have already started thinking about my Autumn/Winter wardrobe. 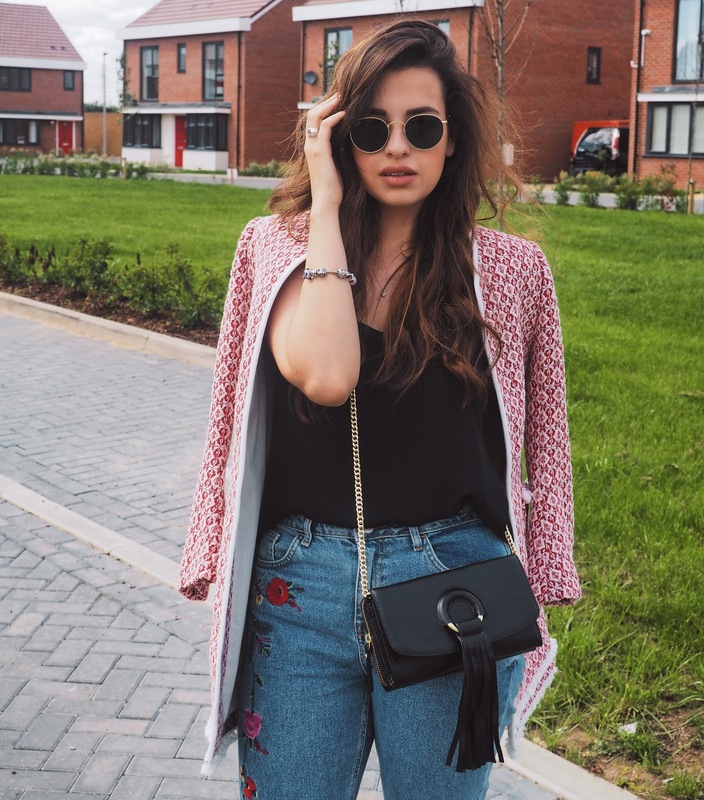 As much as I don't want to let go of Summer, the hit and miss weather has already got me thinking about layering and wrapping up in cosy knits! I'm a big fan of mules for their comfort and versatility. I love how simple yours are. The coat looks great, no wonder it went viral. I'm ready for Fall and will start pulling out light jackets soon as well. Enough of Summer, its been unbearably hot. I know, I am sad summer is literally over! It's been raining on and off for 3 weeks now, I can't believe that heat wave in June was all we had! LOVE this coat on you! A few years ago I got a coat from Zara that went viral too, it was the beige one with the faux leather sleeves, gosh that was a while ago! I find a lot of their stuff goes viral so often, like the blue faux leather jacket a few seasons back too. 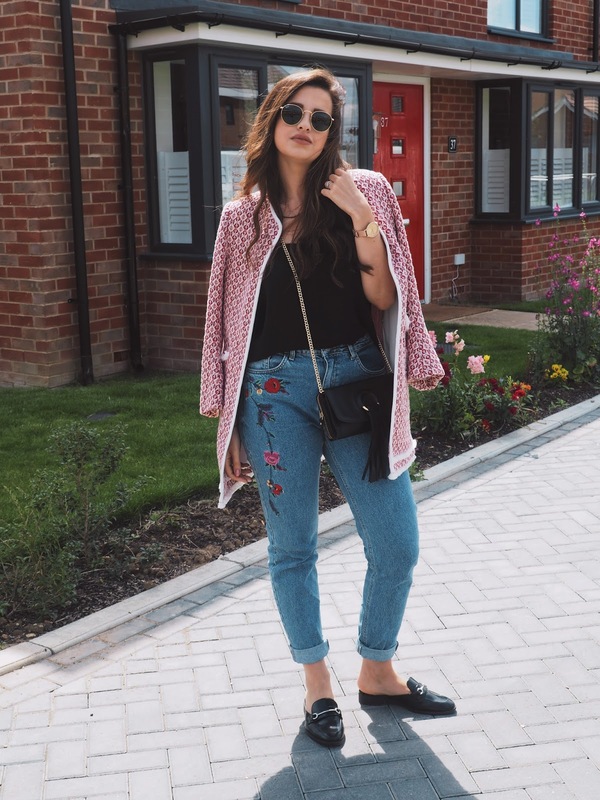 You styled this one perfectly and I love the embroidered jeans too! Love your beautiful outfit, lovely combo as well, all perfectly match. Thank you for sharing, you look gorgeous!!! I miss Autumn and Winter fashion so much so i can see why you are excited! 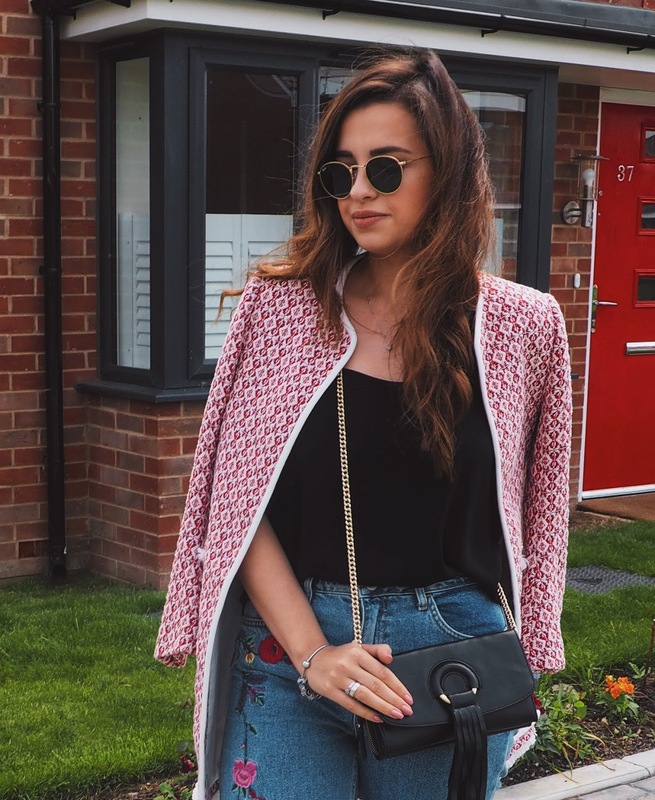 Although it's only in the UK that you would wear a coat in August :P This Zara coat looks absolutely gorgeous on you so I can see why it went viral. The embroidered jeans are perfect too. The embroidery on your pants is super pretty!